Which company will take the gold in the race to Mars? Muilenburg’s answer reiterates a claim he made in October 2016 at The Atlantic‘s “What’s Next” conference — underwritten by Boeing — nearly word-for-word. There, he discussed impending innovations to low-Earth orbit space travel, space tourism and, almost as an afterthought, the first person on Mars. “I’m convinced that the first person to step foot on Mars will arrive there riding on a Boeing rocket,” he said at the recorded event. The “Path to Mars” section on the Boeing website indicates that its Space Launch System (SLS) and crew transportation vehicle, Orion, are in production. Muilenburg described the SLS to Cramer: “This is a rocket that’s about 36 stories tall, we’re in the final assembly right now, down near New Orleans.” Muilenburg said the first test flight is happening in 2019, which will send the Orion on a test flight around the Moon. Ultimately, the plan that Boeing has laid out shows that the company plans on doing missions in Mars’s orbit in the early 2030s, and missions to the planet’s surface in the mid-to-late 2030s. Whether that timeline can beat Elon Musk’s, however, remains a question. Musk and his company SpaceX are almost synonymous with humanity’s quest to travel to and colonize the Red Planet. At the International Astronautical Congress in Adelaide, Australia in September 2017, Musk gave a progress report on the company’s goal of getting us there. 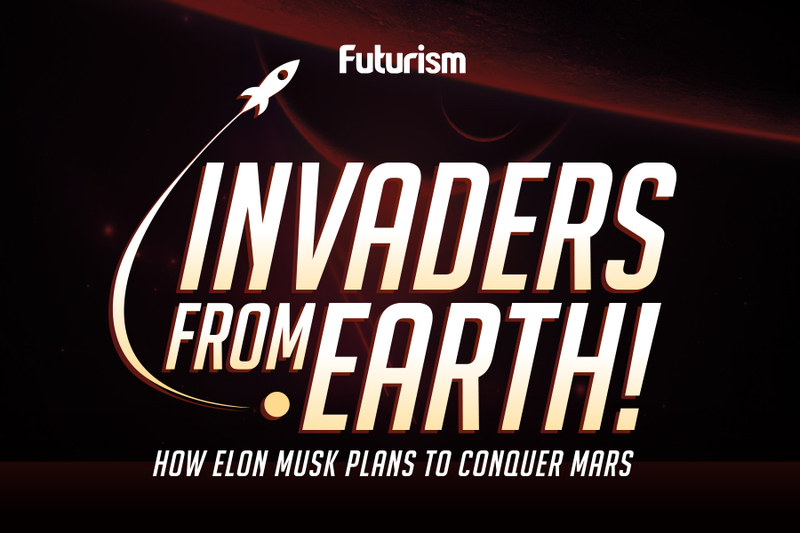 He revealed a new reusable spacecraft capable of refueling in space, the Big Falcon Rocket (BFR), which he said could transport the first colonists to Mars in 2024. 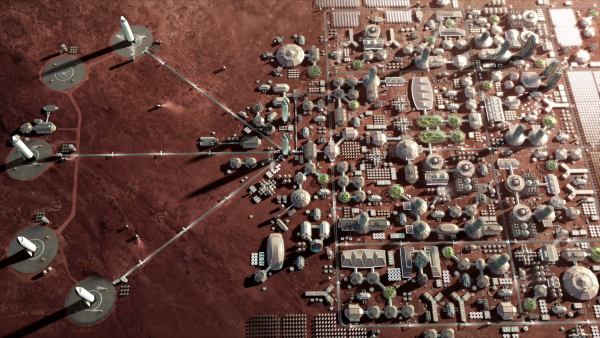 An artistic rendering of Elon Musk’s Mars colonization plan. Image Credit: SpaceX via Wikimedia Commons. Much like when the US and the USSR jockeyed for space supremacy in the 1950s and 60s — each nation pushing the other towards achieving new exploration benchmarks on even shorter timelines — it seems this new space rivalry may ensure we get to Mars as quickly, and cheaply, as possible.